The updated website, which Rhee and his team had been working on since January 2016, includes a portal for people to submit feedback on the new look. Rhee said that, while some of the responses are off-topic and regard the agency as a whole, the vast majority have contained praise for the new site. The revamped site features a slightly different font size and a different tab orientation. One of the main goals was for the site to be completely accessible via mobile devices, according to Rhee. He stated that the majority of USDA website traffic comes from people using mobile devices, and that the new site needed to accommodate these visitors. However, the agency also made use of outside consultation. USDA partnered with WebFirst, a small company based in Rockville, Md. Also, Rhee stated he and his team met with other Federal agencies, such as the departments of Homeland Security and Energy, which had recently refurbished their sites. Rhee said he was pleased that the new site’s launch coincided with the General Services Administration’s finalized version of website standards for Federal agencies. The Federal standards contain rules on colors, font sizes, and best practices. The renovated website’s changes also exist below the surface, Rhee said. USDA’s Digital Communications Office introduced a new content management system for departments within the agency. The old content management system had not been updated since 2005. Rhee’s office attached an addendum to GSA’s standards for the USDA site. 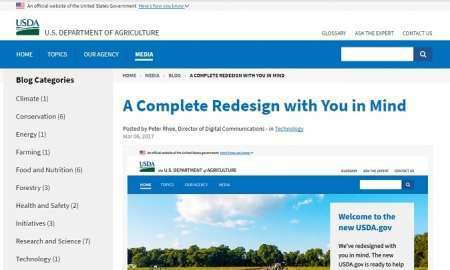 Components within USDA, including the Agricultural Research Service, the Food and Nutrition Service, and the Risk Management Agency, need to adjust their websites to adhere to the agency’s main site. The USDA site’s new look was initially heralded by a blog post on March 6. Rhee said the agency will release a follow-up blog describing the technological methods used to redesign the website in the near future.